It’s been nine months since I last wrote about my experiences as a mesothelioma survivor and small-business owner in Baton Rouge — and plenty has happened in my life. 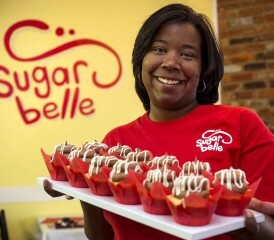 I launched my second Sugarbelle cake bakery in February 2014. For the price of rent, I walked into a fully equipped store with an existing customer base. Before my cancer diagnosis, I probably would have passed on the offer. But after countless rounds of chemotherapy and two HIPEC procedures, I quickly learned that life was priceless and could end at any moment. Opening that business — and eventually closing it after eight months — taught me valuable truths about myself and others. As a cancer survivor, wife and mother of two boys, I also learned keeping your family and your sanity is just as important as survival. I doubled my staff, advertising efforts and labor when I opened the second Bundt cake bakery. Although I thought all the bases were covered, I had not counted on also doubling my own work hours. I thought hiring additional staff would decrease my work load, but it didn’t. I also learned I was more of a micromanager than I cared to admit. My days quickly turned into nights, and my children became weekend visitors. Six months into my new venture and I was physically exhausted from work, mentally drained from employee drama, and overwhelmed with the guilt of becoming an absentee parent. I would sometimes go a week without seeing my children. The daily stress was overwhelming. I also felt horrible that I was crying everyday about something I volunteered to take on. God had given me not one, but two chances at life, and I felt guilty about spending all my days crying my eyes out. If peritoneal mesothelioma didn’t kill me, I definitely wasn’t about to let a cupcake bakery take me out. I had achieved financial gain from the additional storefront, but my quality of life was rapidly diminishing. I made the important decision to seek help before suffering a complete nervous breakdown. After divulging my drama to the psychiatrist, I learned a very important fact: I was so focused on surviving during my two-year mesothelioma battle that I never dealt with the trauma of my diagnosis and possible mortality. During a follow-up oncology visit in Tulsa, Oklahoma, I received a call from one of my employees at my second bakery. She told me there were realtors and appraisers in the building. It was the second time these people had visited. On their first visit, my landlord had told me she was not selling the unit, but merely obtaining a market analysis of the property. However, when I pressed her for the truth, she revealed it: She had indeed sold the building. Just eight months after launching my business, I had to close its doors in 60 days. The new owner wanted the space for her business and offered me another suite that was not conducive to a bakery. The weight of my personal and business problems was too much for me to handle on my own. I decided to fill my prescription for an antidepressant from my psychiatrist. Once the medication kicked in, I was ready to proceed with life. The closing of the second bakery turned out to be a blessing in disguise. Despite all the problems of that location, the business had generated a solid customer following. That’s why I decided to wholesale my goods to retail stores and keep my original location. In addition to the first Sugarbelle, my baked goods are now in two grocery stores, and an additional five stores are in the queue. As fantastic as that sounds, I’m again faced with another dilemma. For the past year, I was blessed to have a great baker who quickly became a second me — in more ways than one. At the age of 22, she was diagnosed with thyroid cancer. As a cancer survivor, I was able to coach her through her mental anguish. While I’m happy to report she is cancer-free, I’m equally sad to say she is no longer my assistant baker. She received an unbelievable offer to become an executive pastry chef in New Orleans — a promising opportunity my little cupcake store may never offer her. Now I’m revisiting my days of exhaustion and baking by myself for three stores. As I said before, I’ve learned plenty about who I am, my priorities, family, how other people don’t come through with their promises and living as a mesothelioma survivor. So I turn to God and pray for my continued health and that of my family, and hope I find another me to help run my cupcake empire.